No, your eyes were not deceiving you. If you saw Beauty and the Beast this weekend, you did see Lumiere, the candlestick, and Cogsworth, the mantel clock, in a new trailer for DreamWorks Animations' The Boss Baby. It was all part of a unique cross-marketing ploy too get Disney audiences to come back to theaters for this March's Alec Baldwin animated comedy. Yes, in a strange move, The Boss Baby invited Beauty and the Beast fans to be his guest! Now, you can watch this exclusive in-theater trailer for Dreamworks Animation's next big franchise starter, which opens March 31! The trailer is titled 'A Tale NOT As Old As Time'. The new trailer for Boss Baby is being considered very unconventional, as most filmmakers do not create marketing material for rival studios. But DreamWorks Animation's thought was, 'If you can't beat 'em, join 'em'. Which is actually a theme that is very alive and well in Boss Baby. This new Boss Baby trailer debuted exclusively in theaters this past Thursday during preview screenings of Beauty and the Beast. 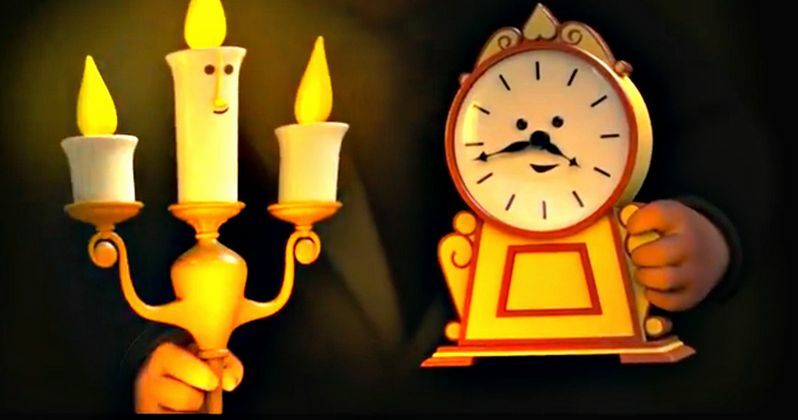 Just as audiences were ready to watch the fairy tale come to life, cartoon versions of Lumiere and Cogsworth appeared from the classic 1991 animated musical. While some audiences members may have been fooled into thinking this was the start of the movie, the camera actually pulls back to reveal that Boss Baby is playing with his Beauty and the Beast toys. The baby goes onto address the Beauty and the Beast crowd. He boldly states the following in his Alec Baldwin voice. "Look, you've all made an excellent decision to come see this movie today. You're clearly shrewd, so let me lay this out for you. On March 31, my movie, DreamWorks' The Boss Baby will be coming out." And with that short but sweet intro, the trailer soon segues into footage from Boss Baby. DreamWorks knew that Beauty and the Beast was going to be a monster at the box office, so they concocted this unusual idea to cash in on some of that movie's success. The team behind Boss Baby came up with the idea a few months ago, and had the trailer specially designed to ride the Disney musical's coattails. Jim Gallagher, DWA's marketing chief, had this to say about the trailer. "You normally don't do a new theatrical piece two weeks out, or a custom piece targeting another property. Usually, the payoff, or final trailer debuts, some three months before a movie's release. We really wanted to take advantage of Beauty and the Beast and talk directly to our audience in a way they were not expecting." The Boss Baby will be in theaters on March 31, just two weekends from now. Will its inclusion at the beginning of Beauty and the Beast help boost its box office? Perhaps. But DreamWorks has had no problems succeeding at the box office without Disney, so it's possible their latest would have been a hit even without this unique assist. You can watch the full Beauty and the Beast themed Boss Baby trailer here.